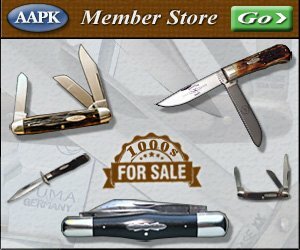 Clip: The clip blade is generally the most common blade found on American folding knives. They have a concave curve from the back of the blade to the point, and a cutting edge that slopes upward to the point. These features make them extremely versatile and enable them to perform almost any cutting tasks. Some of these blades have a longer concave curve on the top that generally makes for a narrower blade. The narrower blade creates a sharper tip that is better suited for detail work but is not as strong. The narrow clips are often called California clips, muskrat clips, or Turkish clips. Coping: These are narrow blades that have a sharp point. The edge is flat like a sheepsfoot, but the back angles sharply from the spine. They are ideal for cutting patterns on a flat surface. Also, their thin size makes them handy when cutting in tight spaces. Drop-Point: The drop-point style blade has a convex curve on the back that slopes downward toward the point, and a cutting edge that slopes upward in a slightly more dramatic fashion to the point. These features create a wide tip that is very stout and ideal for heavier tasks. The wider tip is not as handy for penetrating through an object as the spear and clip blade. tasks. The back and the edge of the blade generally slope evenly (at the same degree) to the point. They are much like the spear blade but are smaller. These blades were originally designed to sharpen quill pens. Pruner: These blades have an edge that curves in a concave fashion to the point. The back of the blade curves in a convex type fashion to the point. These characteristics result in a blade that resembles a hawk’s bill. Because of this, they are often called hawkbill blades. They were originally used for pruning shrubs and fruit trees, but are now handier for cutting sheetrock, carpet, roofing paper and other such materials. Sheepsfoot: This blade has a flat cutting edge, and a back that slopes to the point. The blade looks much like the hoof of a sheep (imagine that…..). This blade is ideal in yielding a clean cut on objects lying on a flat surface. Spear: This blade has a back and cutting edge that curves in the same fashion or degree and meet at the point. Some spear blades are thicker than others. The thinner blades are ideal for penetrating through objects, while the thicker versions are slightly less handy for penetration, and more handy for heavier tasks. The blade tip is less likely to break than the thinner version. likely to be accidentally poked through a surface. These blades were originally developed for use in castrating animals. Wharncliff: These blades have a strongly curved back and a flat edge. This design results in a needle type point that is ideal for cutting cleanly on flat surfaces and for cutting meticulous designs.